At the age of four Alexander St. Clare was stolen by gypsies and sold to a chimney sweep. At the age of five he was reunited with his father. His history is no secret—everyone in the ton knows of his miraculous rescue. Alexander St. Clare, seventh Duke of Vickery, found his father’s diaries by accident. He was working at the massive oak desk in the study, reading through the latest report from the bailiff on his Lincolnshire estate and jotting down notes, when the tip of the quill split. “Drain the north paddock,” he muttered under his breath, while he opened the top drawer of the desk and searched for a penknife. The penknife was at the very back of the drawer. Alexander groped for it, banged his knuckles against wood—and then the wood yielded and the penknife skittered out of reach, deeper into the desk. Damn. He’d broken the drawer. Alexander carefully removed it—and discovered that the drawer wasn’t broken at all; the back was hinged, with a little catch that he must have knocked open. He got down on his knees and peered into the gaping slot. Was that a secret compartment? In his father’s old oak desk? He reached in and felt carefully. Yes, a secret compartment. The penknife was in there, and . . . books? Alexander drew the books out. There were six of them, bound with calfskin. He opened one and saw his father’s handwriting. June 17, 1808. The young people all went riding again this afternoon. Alexander hastily closed the diary. He replaced the drawer, stacked the diaries on the farthest corner of the desk, trimmed his quill, and went back to his notes. Drain the north paddock, he wrote, and then stared blindly at the bailiff’s report. The young people all went riding again this afternoon. He could see it in his mind’s eye, the four of them cantering along the clifftops: himself and his two best friends, Hubert Cathcart and Oliver Dalrymple, and Oliver’s younger sister, Georgiana. God, what a painful summer that had been. The summer he’d fallen in love with Georgiana. The summer she’d fallen in love with Hubert. Alexander gave himself a mental shake. He tried to focus on the bailiff’s report, on the here and now, but that glimpsed diary entry had dislodged a cascade of memories. His mind took him back six years. He remembered how happy Georgiana and Hubert had been, how they’d glowed with joy, and he remembered congratulating them on their betrothal while in a secret and shameful place deep inside himself he’d been hoping the wedding wouldn’t take place. The wedding hadn’t taken place, and that had been a thousand times worse. Hubert had gone up to Scotland to visit his godfather and had never returned, vanished somewhere on the road between Edinburgh and Perth. Alexander had hoped and prayed for Hubert’s return, he’d got down on his knees in the Thornycombe chapel and begged God for it, but weeks had become months, and then years, and then finally Hubert’s grave had been found, nowhere near Perth or Edinburgh. Alexander stared down at the bailiff’s report, not seeing the words. Damn it, Hubert, I wish you had come back. Alexander looked up. A footman stood in the doorway to his study. Two o’clock. Alexander’s thoughts jerked from Hubert to Georgiana. He put down his quill, took the items the footman handed him—hat, riding crop, gloves—and strode from the study. His mood changed as he ran down the stairs two at a time, shedding grief, letting hope take its place. Two o’clock. Afternoons had always been his favorite time of the day. When he was a boy he’d spent them with Hubert and Oliver, exploring the long, shingly Dorsetshire beaches, climbing the cliffs, hunting for fossils, fishing and eeling and birdnesting, getting wet, filthy, sunburned. Now his afternoons were special because of Georgiana. His horse, Sultan, was saddled and waiting in the stableyard. Alexander suspected that afternoons were Sultan’s favorite time of the day, too. Certainly the horse caught his eagerness, lengthening his stride into a canter as soon as they reached the lane. Thornycombe Hall to Dalrymple Court was less than a mile. Alexander covered that distance in four minutes. Hedgerows flashed past, birds twittered, the Dorsetshire sun shone down, and then he swung into the avenue and there she was: Georgiana Dalrymple, on her bay mare, waiting for him. Alexander slowed Sultan to a trot, then a walk, and came up alongside her. A smile broke out on his face, the smile that was only for Georgiana, the one that said, I love you. They galloped along the clifftops and then let the horses amble. Alexander looked out at the wide vista of sea and sky, and then let his gaze stray to Georgiana. He loved it when she looked like this, cheeks flushed, eyes bright, curling tendrils of hair escaping from beneath the brim of her hat. It made him want to lean over in his saddle and kiss her. She was no longer the girl he’d fallen in love with; she was a woman, now, more confident than she’d been all those years ago, more assured, but quieter, too—and still, after all this time, the person he wanted to marry. He let his gaze rest on her—the sparkling brown eyes, the soft brown hair—and thought of the things he loved most about her: her quick mind, her thoughtfulness, her sense of humor, the way they could talk so easily, laugh together, be quiet together. That was another thing he loved about her: that she called him Vic. Not Your Grace, not Vickery, but Vic. She sees me as a person, not a duke. “Vic?” she said a second time. And so they galloped again, the horses’ hooves thundering, kicking up clods of turf, and when they pulled up Georgiana was flushed and breathless and laughing, and Alexander felt a painful sensation in his chest, a sensation that combined longing and desire and hope. The horses came up alongside one another, flanks heaving. Georgiana grinned at him, and she looked like the girl she’d been six summers ago, vivid, alive, glowing—except that this time the glow in her eyes was for him. His knee touched hers briefly and their bodies swayed together and there was a moment when they looked into each other’s eyes, when a frisson shivered over his skin, when Georgiana seemed to hold her breath, when he almost—almost—leaned over and kissed her. And then the horses moved apart and the moment was lost. They rode slowly back to Dalrymple Court and while they rode Alexander debated his options. It was barely a year since Georgiana had had the strange, prophetic dream that had told her where Hubert’s grave was. Was it too soon to pay his addresses? Should he wait a few more months? 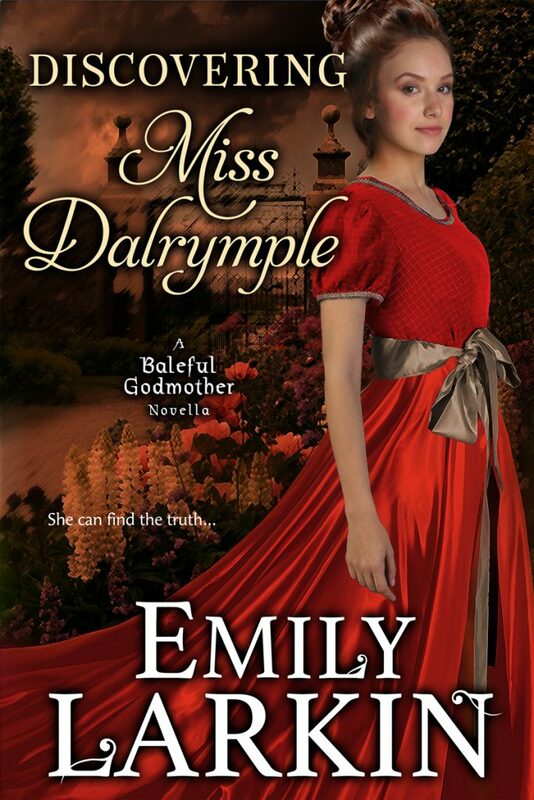 Dalrymple Court came into sight: the tall chimneys, the creamy stone masonry half-covered with ivy, the rose garden. They halted side by side in the lane. “Would you like to come in?” Georgiana asked. Alexander studied her face. Something in her expression, in her eyes, made him think that she felt the same sensation he did: the longing, the hope. An hour later, Alexander ran up the stairs to his study, whistling under his breath. He tossed aside his hat and riding crop, peeled off his gloves, and paced the room, too exhilarated to sit, treading across the Aubusson carpet, backwards and forwards, backwards and forwards. Lord and Lady Dalrymple had said yes. Now he just had to hope that Georgiana would say yes, too. He crossed to the window and stared out. He would ask her tomorrow. After they’d galloped along the clifftops, when they were windswept and laughing. He felt the words on his tongue, heard them in his ears: Marry me, Georgie. Should he tell her how long he’d loved her? Why he loved her? Alexander considered this for several minutes. No, he wouldn’t mention Hubert, not while asking Georgiana to marry him. He stared out the window and imagined it: Tomorrow afternoon on the clifftops, sunshine, a salty breeze, the thunder of the horses’s hooves as they galloped, and then afterwards . . .
He’d wait until they’d both caught their breath and then he’d say, Georgie, will you please marry me? And then he’d tell her all the reasons why he loved her. A maid came to light the candles before dusk. When she’d gone, Alexander sat at his desk and glanced at the bailiff’s report, but he was too preoccupied by thought of tomorrow to pay it the careful attention it needed. His gaze drifted to his father’s diaries, stacked on the corner of the desk. What should he do with them? He picked one up and flicked through the pages, remembering his father’s voice, his dry laugh. And then he remembered holding his father’s hand while the old man died. Alexander’s throat closed for a moment. He blinked several times and turned to the very beginning. There was an inscription on the first page: Leonard Aubrey St. Clare, Duke of Vickery. And underneath that: To be burned in the event of my death. Alexander had a flash of memory so strong that he almost smelled his father’s deathbed—the camphor, the lavender, the beeswax candles. For a fleeting moment he could have sworn he felt his father’s hand in his: the cooling skin, the lifeless fingers. His throat closed again. He needed to blink a few more times, and then he gathered up the diaries and crossed to the hearth. A fire was laid there, but not lit; it had been a warm September. He kindled the fire, watched the flames take hold—and found himself unable to burn the diaries. His father had been dead for two years, but this felt like a second burial; these pages held his father’s thoughts and emotions and experiences. Alexander examined the diaries. The calfskin was scuffed in places, shiny in others, worn by his father’s hands. What could it hurt to read one entry? The day of his birth, nothing more. An entry that bound him to his father. And then he’d burn the diaries and lay the old man to rest again. He lowered himself into the leather armchair by the fire and thumbed through the diaries until he found the right one, but the entry for January 25, 1785, didn’t mention his birth. In fact, it appeared that his father had been in London, not at his wife’s bedside in Kent. Alexander turned the page. On January 26, squeezed between an account of a visit to a perruquier and some jotted notes about improvements to make on the Wiltshire estate, were three sentences: An express came from Kent. Lucretia has delivered a child. A boy, thank God. And that was it. A disconcertingly short three sentences. Alexander turned the page, and discovered that his father had traveled to Kent on the twenty-seventh. The boy looks healthy, his father had written, but he has the oddest eyes. As diary entries went, it was even shorter and more disconcerting. There was no further mention of his birth. On January 29 his father had gone back to London, where he’d remained until halfway through February, when he’d visited the estates in Cambridgeshire, Northamptonshire, Oxfordshire, and Wiltshire. In May he’d returned to Kent and stayed only long enough to see his son christened before heading back to London. Alexander frowned at the diary. The writing was his father’s, but the man who’d written the entries wasn’t the father he remembered. He flicked further ahead. His father wrote about his estates, about politics, about the war with America, about the latest on-dits, but only rarely about his wife, and even more rarely about his son. Every two weeks came an entry that said: A letter from Kent. Occasionally an extra sentence was appended. Lucretia says that Alexander’s first tooth has come through. Lucretia says that Alexander is crawling. Alexander thumbed through the pages, skimming. As far as he could tell, in the first two years of his life his father had seen him only five times. Five times? In two years? He put the diary aside, disturbed, and got up to pour himself a glass of brandy. He frowned at the fire while he sipped, frowned at the stack of leather-bound diaries. He didn’t know the man the diaries described. Didn’t know him at all. Perhaps he changed when Mother died? Alexander found the diary for 1788. His father had been in Leicestershire. An express from Kent. Lucretia is dead. She fell down the stairs and broke her neck. Alexander turned the page and read further. His father had traveled posthaste back to Kent, seen to his wife’s burial, hired a second nurserymaid for his three-year-old son, and gone to Wiltshire. What? My mother died and you didn’t stay with me? You left me with nurserymaids? Alexander squeezed his eyes shut and rubbed his forehead. He’d loved his father—but he didn’t like the man who’d written the diaries. He opened his eyes and stared at the fire for a moment, and then raised his gaze to the candelabrum on the mantelpiece, where three candles shed golden light. There was a candelabrum on the sideboard, too, alongside the decanters, and another one on his desk. Candles everywhere in the study. Candles and light. The maid would have lit all the candles in the corridors, too, and the candles in the dining room, the library, the drawing room, the billiard room—any room that he might conceivably wish to enter tonight. It was a huge extravagance, but it was also a necessity. Because he found it difficult to breathe in the dark. He’d found it difficult to breathe in the dark ever since he’d been five years old. Alexander looked at the candles on the mantelpiece—and knew the exact day his father had changed. He drained the brandy glass, put it to one side, and picked up the diaries again. There was a hard, sick knot in his stomach. He found 1789. Found May. Found June. Alexander turned the pages reluctantly. June 8. June 14. His throat was tight, his shoulders were tight, his chest was tight. He forced himself to inhale, to exhale, to turn the page. June 20, 1789. An express from Kent. Alexander is missing. The nurserymaids took him into the woods for a picnic and he was abducted by gypsies. Alexander’s heart was beating too fast. There was sweat on his upper lip. He wiped it away and turned the page and read of his father’s hasty journey to Kent, read of men searching the woods and scouring the nearby villages. I’ve dismissed the nurserymaids, his father had written. How dare they take Alexander into the woods without my permission? And then an anguished: Where is my son? Alexander thumbed hastily through the next few months, skipping over the details: the advertisements in the newspapers, the posters and the flyers, the search widening beyond Kent into Sussex, into London, into Hampshire. February 14, 1790. An express from Exeter. One of my men thinks he’s found Alexander in the employ of a chimney sweep. Alexander released the breath he’d been holding and turned the page. His father had covered the two hundred miles from London to Exeter in two days. It’s Alexander, he’d written on February 16. There can be no doubt. Those eyes. But he’s shockingly thin. His cheeks are quite hollow and he has bruises where he’s been beaten. He hasn’t said a word yet. Not one. He flinches whenever anyone touches him, even me. He doesn’t recognize me as his father, but how could he? It’s been almost a year since I last saw him, and then only for five minutes. I wouldn’t recognize him myself, but for those eyes. I won’t have a nurserymaid near him. I have sworn an oath to that: No nurserymaids, ever again. It was I who fed him tonight, who bathed him and put him to bed and sat with him until he slept. I stroked his hair once he was asleep, and he didn’t flinch, and then I held his hand. I’m holding it now as I write. I don’t ever want to let it go. Alexander put down the diary. He crossed to the decanters and poured himself another glass of brandy. He gulped a mouthful, coughed, and swallowed a second more cautious mouthful. And then he went back to the diaries and read into March and April. It didn’t surprise him to learn that he’d been terrified of the dark, terrified of small spaces, that he’d had nightmares every single night, but it did surprise him to learn that he’d been mute for months. May 10, 1790. Alexander spoke for the first time today. One word only, but that word was “Father.” I didn’t know whether to laugh or cry, so I did both. May 14, 1790. He spoke a full sentence this morning. June 1, 1790. Alexander laughed today. And I laughed, too, and then afterwards I cried with relief, because I know he’s going to be all right. If he can laugh, he’s going to be all right. June 17, 1790. He’s chattering all the time now. I never thought it would give me such joy to hear a child’s voice. The diary ended in 1791. Alexander picked up the next one. He turned the pages slowly, carefully. This was the father he remembered, the father who’d read him to sleep every night, who’d sat at his bedside when he was sick, who’d always had time for him, who’d never once said, Not now, Alexander. I’m too busy. The father who had loved him. The father he had loved. He saw himself grow up through his father’s eyes. April 10, 1792. I can’t bear to send him to Eton yet. He’s still too thin. I’ve decided to take him to Dorsetshire instead. The sea air will do him good. August 3, 1793. Dorsetshire agrees with us both. Alexander is a sturdy wee fellow now and as brown as a berry. I’ve taken his name off the Eton roll. March 16, 1798. He’s only thirteen and yet he’s already as tall I am. He quite dwarfs his cousins. I have no doubt that he’ll dwarf me before the year is out. December 8, 1801. Alexander has grown out of his clothes again. He’s over six foot, now. If his shoulders grow any broader he’ll not fit through a door. I told him that and he laughed. He laughs a lot, my boy. July 30, 1803. It’s time to think of sending Alexander to Oxford. I hate to let him go, but he’s a man now and he needs to find his feet in the world. I have no doubt that he’ll enjoy university. He has a gift for making friends. January 25, 1806. Alexander is twenty-one today. Perhaps it’s a father’s partiality, but I truly believe there’s no finer man in England. It’s a comfort to know I can pass the dukedom to him. He’ll bear that burden far better than I have. He’s so level-headed. And despite what happened when he was a child he has a merry heart. May 11, 1807. A letter from Lucretia’s brother telling me it’s past time that I arranged a marriage for Alexander. Damned impertinence. I refuse to do to Alexander what my parents did to me. He will choose the bride he wants, when he wants. The next diary covered 1808 to 1812. Alexander skipped over the first two years. He didn’t want to read about Georgiana’s betrothal or Hubert’s disappearance. He thumbed through 1810 and 1811, reading the odd entry, and slowed when he reached 1812. The handwriting grew spidery, shaky. He turned the pages gently, feeling grief well in his chest, remembering his father’s decline, the way he’d spent less time in the study and more in his bed. A terrible thing happened today. Alexander came to sit with me after my nap and for a moment I didn’t recognize him. “Who are you?” I asked, and he said, “Your son,” and I looked at him and knew that he couldn’t possibly be, not with that face, not with those shoulders. A terrible fear grew in me. What if I had rescued the wrong boy all those years ago? I asked Alexander to take me to the Long Gallery, and we spent half an hour looking at the portraits together. I couldn’t find anyone who looked like him. Where did he get his height from? Those eyebrows? That chin? They’re not mine, and they’re certainly not Lucretia’s. Alexander saw I was distressed. He took both my hands in his and asked what was wrong, and I looked into his eyes and knew myself for a foolish old man. Those are my son’s eyes. There can be no doubt. But now, without those eyes looking at me, the doubt has returned and I can’t sleep for fear that I rescued the wrong child. Alexander is my son. He has to be. If my boy is still lost out there I couldn’t bear it. Alexander stared at the entry for a long time, and then turned the page. There was no mention of his shoulders or his eyebrows in the next entry, or the next. The journal advanced a few more days, and then abruptly stopped. He sat still for a moment, then turned back to August 26. He read what his father had written. I can’t sleep for fear that I rescued the wrong child.